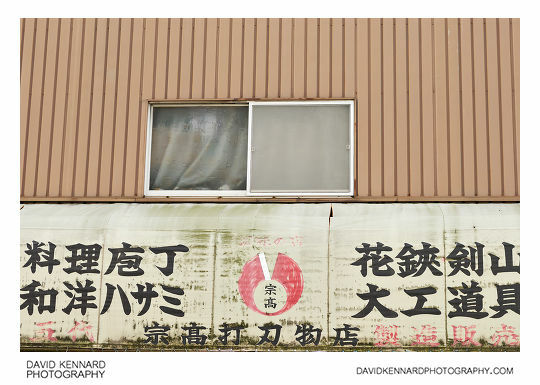 This post is part of a series on my visit to Osaka while on holiday in Japan during October 2009. If you haven't read the first part, that's here: Japan Day 1 pt. 1 - Namba Yasaka Shrine. After finishing looking round Namba Yasaka Shrine, we carried on our random walk round Osaka. 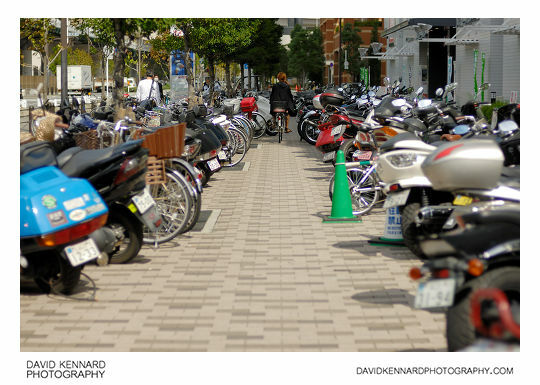 In Japan bikes are a popular form of transport, and you'll often find areas dedicated to bike parking. I managed to grab the above shot with a woman cycling down the centre between the rows of bikes, which I think adds a bit more interest to the photo. It would have been better if I'd been a bit quicker though and take the photo when she was nearer the camera (and so larger in the frame). Walking on, we came to an area known as Nipponbashi or Nihonbashi (日本橋), which is known for its electronics stores. The part of Nipponbashi that we walked through seemed to be more standard shops though. 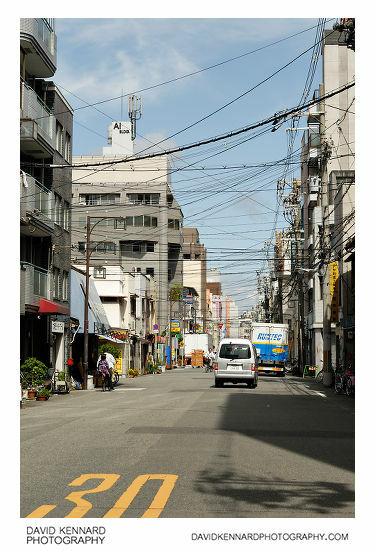 You can see in the above photo there are a large amount of overhead wires that criss-cross the street. ¥100 for a drink is quite good as far as prices go. Most drinks machines are priced more like ¥120 - 150. So we bought some drinks from this machine for our lunch to go with our food we'd brought from Korea before we left. This one above is a Two Down (ツーダウン Tsūdaun) machine. 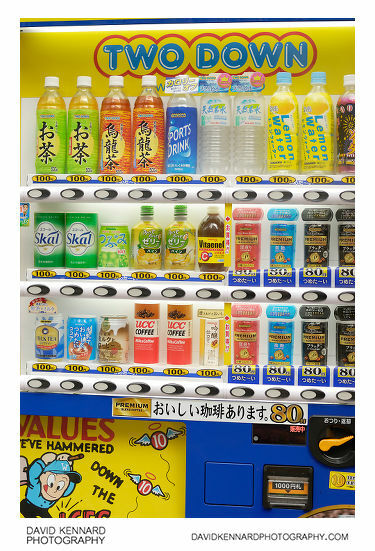 Drinks vending machines (and also other vending machines) are very popular in Japan. It's quite handy since if you're thirsty you don't normally need to walk too far until you'll come across one (at least in the cities and towns we visited). In the UK drinks from vending machines tend to be much more expensive than the same drink bought from a shop, and machines only tend to be located inside buildings. Whereas in Japan machines are usually outside (lack of vandalism makes this possible), and prices are around the same in shops (because the shops are so expensive). Although the fascia of this shop was old and weathered, it was for a currently operating shop, not an old closed down shop. On the left of the fascia it says 料理庖丁 和洋八サミ , on the right it says 花鋏剣山 大工道具 , and underneath it says 宗髙打刃物店 . There is also some writing in red that is too faint for me transcribe. Google doesn't translate it all (maybe I transcribed it wrongly), but it seems to be a knife shop that sells various knifes including kitchen knives and work tools. I imagine the window above the fascia is for a residential flat above the shop. We came to a small park, and so stopped to eat some lunch while we watched some old men play something like boules, and a couple of kids play on their gameboys. 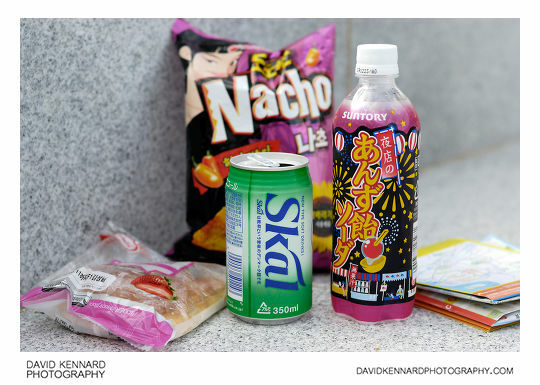 Above photo is our nice healthy lunch of snacks bought in Korea and drinks bought earlier from the Two-down vending machine. After lunch we carried on our wandering and came to Sainenji (西念寺) temple. 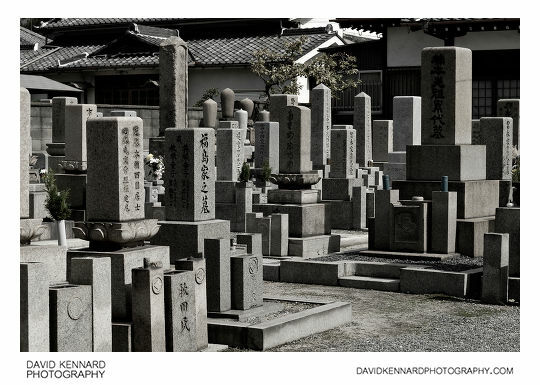 We didn't look round the temple, but I took a photo of some the gravestones out the front of the temple. Graves will normally be for a family rather than an individual, and the dead will be cremated (so no digging a grave each time someone dies).